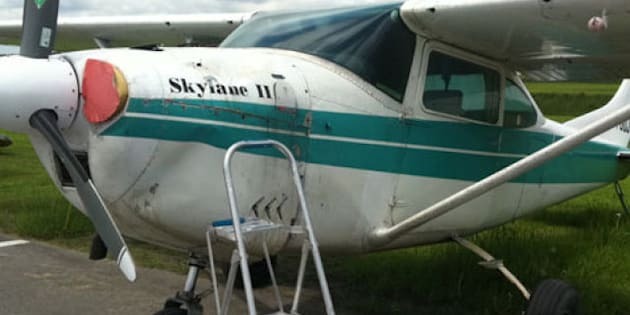 CBC -- Five skydivers had to make an early exit from their plane Saturday afternoon after the single-engine Cessna-182's engine failed while flying over Gatineau airport in Quebec. The plane was flying at 10,000 feet when GO Skydive instructor François Hamel and four experienced skydivers felt and heard a small explosion on the plane. "Like a big 'pow!' Then a [noise] like when your car's just about to stall. I could see some little pieces falling off, like metal pieces from the plane... some oil and a little bit of smoke," said Hamel. Pilot Elliott Manuel called mayday and began to steer the plane towards a landing spot, as engine oil covered his windshield. So about five minutes ahead of schedule, the skydivers jumped, one at a time, at an improvised landing spot. Three skydivers landed in a field two fields away from the regular landing site. Hamel was one of two who parachuted down near Highway 50, with his own drop finishing on the grassy median. "I landed in between the left and right lane in the highway," said Hamel. "I'm just thinking, just hoping he's going to land the plane on the runway," said Hamel. Manuel, a pilot with four years of experience, remained calm. "When I was gliding down I could actually see the emergency services coming," said Manuel. "And the first thing that came to me was, 'Where are they going?'" Manuel soon realized that he and his plane were the emergency. About 15 minutes after the engine failure, he glided into Gatineau airport. Pierre Carpentier, the co-owner of GO Skydive, said Manuel, in his first year with the company, was trained for the procedure, and said the company's planes keep near the airport for just such an occasion. Carpentier downplayed the significance of the event. "It's routine that the experienced skydivers and the instructors will go do the last load of the day," said Carpentier. "So we went up and did a jump. So it's just an added event. It's an aviation situation, not a skydiving issue." GO Skydive said it leased the plane but is responsible for its maintenance. The company overhauled the engine a year ago. Manuel was simply glad to walk away. "It felt just relieving when I could step out and was on the ground again. It felt really good," said Manuel.